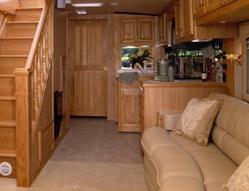 RV-Star-gazing-decks,Trailer upgrades and patio built to tops of rv and trailers, Enjoy your star deck now! 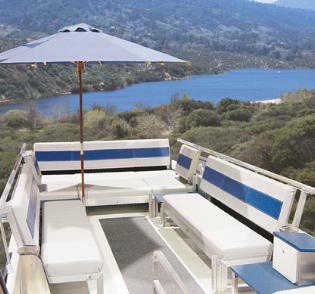 Our Best design for custom built Star gazing decks for your RV or Trailer reinforced to withstand your companies weight and made for aero dynamics to reduce drag, We at The paint dept know trailers. I'm also in the design stages for a roof deck on my 89 safari serengeti. I've had a 87 bluebird bus we put a roof deck on and an 79 MCI Coach. Both of those units were indestructable and a smidge tougher, but I believe that an roof deck can be put on an rv and still have some class. But you'd have to take some time and do it right. My ideals with the serengeti are that we have sthe stainless steel panels around the bottom 20" or so. I'd like to duplicate that idea around the top but only about 8"-12", starting from just above the awning strip and going up. This stainless could attach to the side of the rv where i feel it has the most strength and allow me to fasten square tubing rails that span the roof from side to side. Deck it with some aluminum diamond tread or even white rv roofing and you have your self basically a double roof, but i feel it should hold up just fine. the extra hight of the 8-12" stainless can hide foild down railing etc. There are always unclear things i haven't figure out quite yet, like making sure the water got off the roof if you creat a bowl, with the stainless. But i think that could be accomplished with drain holes and our cosmitic looking slits in the steel. I've got all kinds of ideas.....but in the end...I think its a must if you're RVing at the races!! !